I was invited to take part in Slurrpy’s cookalong highlighting two ingredients a week for the month of December which will be used by a group of bloggers around the world. I missed last week’s cinnamon and pear but you can find a great introduction to the month by reading Tammy’s recipe for dessert pear crumble here. This week the ingredients we were given were lemons and fish. I had recently made up a batch of preserved lemons to give as hostess gifts and decided to pair that with pickled garlic to make a gremolata. Gremolata is traditionally served with osso bucco and makes use of parsley for the herb. As I was using North African flavours, I decided to pair my lemons and garlic with coriander. I had added a few chilli flakes to the preserved lemons when I made them to give them a kick and that additional note created a perfect match for the fresh yellow tail I bought yesterday. 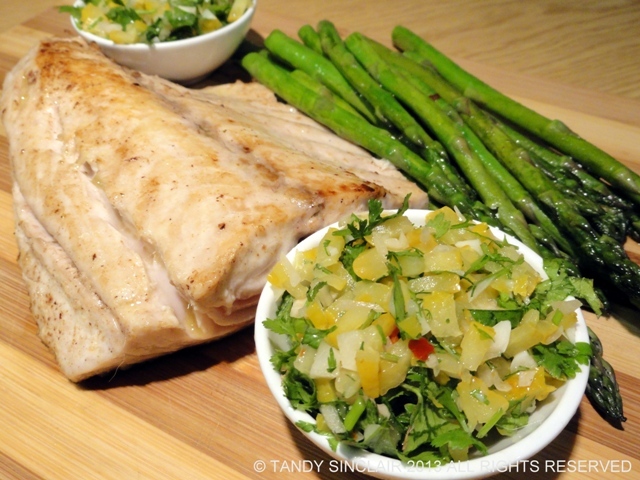 This preserved lemon and pickled garlic gremolata will work well with any fish you can find and it also married well with the asparagus that I served with our fish. I’ve made gremolata but never with preserved lemons and of course, like others, I love the addition of coriander. Nice recipe Tandy. Gorgeous flavours – love coriander too! I love that you added coriander to this, one of my favorite herbs! Yummy! I bet it’s so nice a refreshing. i think a little touch of chopped chilli and red onion made it perfect for my asian licking Tandy! Oh, I will have to try it with rice!